One year ago he ran the 9th Termoneeny 10k, but about 10,000 days ago Tommy Hughes was lining up with John Treacy to run for Ireland in the men’s marathon at the Barcelona Olympics. Despite winning the 1991 Dublin Marathon, it took a remarkable personal best time of 2:13.59 in the Marrakesh Marathon just months before the games to secure his place on the plane to the Catalan capital. Hughes’s feats in the Moroccan city stands as the 12th fastest time for the marathon recorded by any Irish man. Little wonder then that he is regarded as a hero of local athletics. This weekend sees Hughes’ local club in Termoneeny celebrate their own milestone with the hosting of their 10th annual 10k event. The club, officially formed on 22 June 2009 when 14 people met to elect their first committee, post-dates the first race, which was held 6 weeks previous. An idea tossed around between Patrick Farren and Brendan O’Kane gave birth – after much paperwork – to the first annual Termoneeny 10k, held on 10 May 2009, where local man Seán Henry fired the gun that sent 120 runners out into roads though Knockloughrim, Rocktown, Drumard and Gulladuff. When all costs were covered, that inaugural event made £400 profit, which was split in two and used to found a running club and a cycling club. It’s a testament to community spirit that both Termoneeny clubs are still going strong ten years on. Tommy Hughes, among the 250 participants in 2017, was joined by his son Eoin and brother Damian in what has become a May-time family tradition. It’s not the only one. The Belfast Marathon was described as ‘home’ in a 2011 interview given by Tommy Hughes. 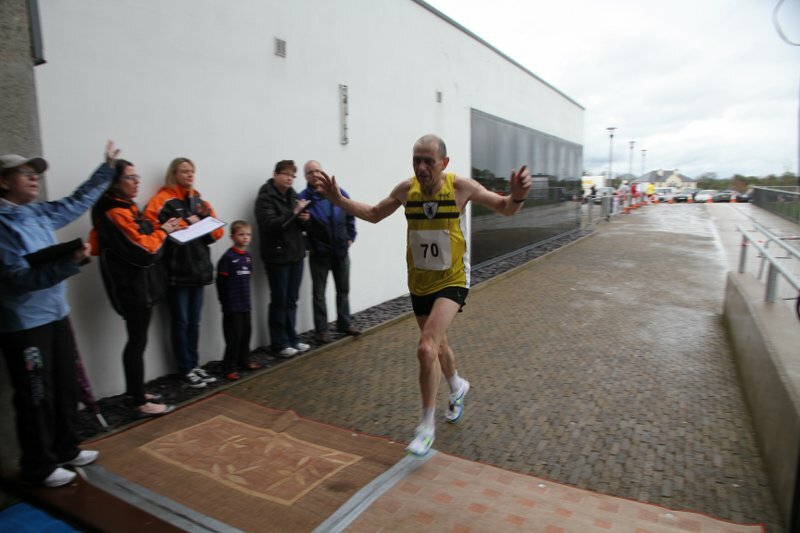 Winner of the event in 1988 and 1998, Hughes, a former member of North Belfast Harriers now runs for Termoneeny as well as Leicester Coritanian Athletics Club, where he currently lives, and where he also enjoys racing motorbikes around the nearby Donington Park. 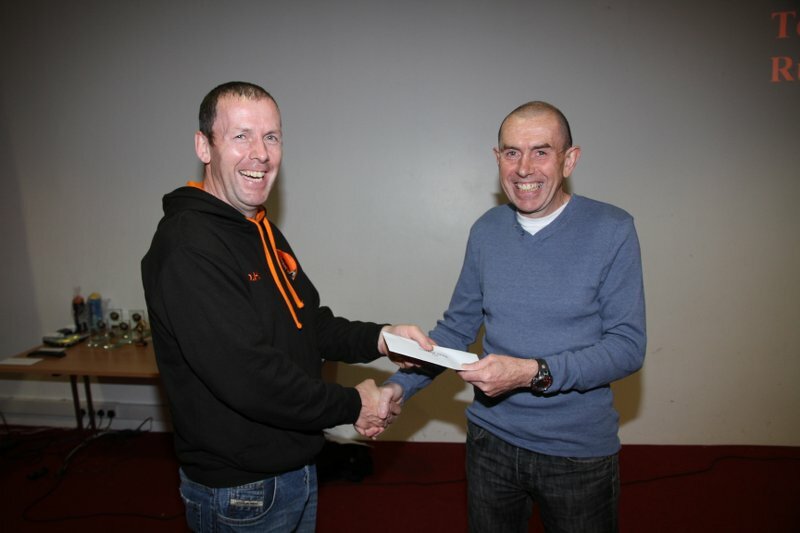 Tommy Hughes receives his prize for winning the 2013 10k from his brother Damian. Running the 2011 Belfast Marathon alongside Tommy and his other brother John has given Damian Hughes unique insight into his elder brother’s competitive nature. “He goes very quiet in the lead up for a race. There’s no chat. He just gets into that zone and the race is all that matters,” says Damian of one of Ireland’s most successful long distance runners. Competing at the Olympic Games is a truly remarkable pinnacle in any athlete’s life. But, for Tommy Hughes, the story doesn’t stop there. His sheer desire, willing and enjoyment of running has given his involvement in the sport a longevity that perhaps even eclipses all of his other achievements. Leaving full time athletics following the 1992 Olympics, Hughes has run over 50 marathons, at times up to 5 in a year, and in 2013 hit the headlines when, aged 53, he triumphed at the Walled City event in Derry with a time of 2:30.32 – a full 29 years after his first victory on the course. “This ranks right at the top of my career achievements. I shouldn’t be doing these kind of times at my age,” Hughes told the waiting BBC sports reporter. The feats of Tommy Hughes have long been talked about in local running circles. At one end of the spectrum his excellence in his sport has inspired promising young athletes to greater things, among them Tommy’s son Eoin and nephew Jarlath, both well on their way to becoming accomplished runners. But it’s in events like the Termoneeny 10k that his legacy perhaps has greatest impact. The sheer number of people now recognising the need for a healthy lifestyle through participation level running, and the social bonds that it creates and helps to maintain, can only be good for the overall health of any community. It’s something that the local club are only too well aware of and of Hughes role in it. “Tommy has taken part in many of our races down the years and it’s always been an honour to have him here,” said the current chairman of the Termoneeny club, Stephen Pickering. From Marrakesh to Barcelona to Gulladuff, the world’s true heroes are all local heroes. In a tribute befitting the man and the occasion, the club have revealed that they will unveil a new trophy for the tenth Termoneeny 10k. The Tommy Hughes Cup will be a lasting gesture to a local athlete who knows how to last the distance. The 10th Termoneeny 10k and 5km fun run/walk takes place on Friday 11 May at 7.30pm. Entrants are encouraged to register online at termoneenyrc.com. Entry fees are £12 for the 10k and £5 for the 5k fun run/walk.